Oh I know, I’m the first one to jump on an opportunity to point out the many holes and errors in the Mormon Church. Believe it or not, there are some areas of thought and principle where I believe the LDS leaders get it more right than the majority of their members. Yes, sometime the leadership and organization are actually less fanatical about certain issues. The real interesting point is that they rarely feel the need to clarify any of these issues, but they just sit back and let the crazy take over. Sometimes LDS members have an eagerness to take an off-hand comment, or counsel and run with it as if it were a commandment. You’d think a reasonable leadership would either be more careful about what is said publicly or at least clarify more often. For example, I don’t think Hinckley ever actually intended his whole one earring fiasco to get blown up into the symbol of righteousness that it is now. Even fellow General Authorities quickly hopped on that bandwagon and a good prophet never taps the brakes apparently. The Word of Wisdom is the most obvious example. What has become one of the most defining characteristics of the Mormon Church today was originally just some homespun advice to make the Prophet’s wife happy. It is today followed and heralded with a passion that exceeds its original intent. And the Mormon Church itself is fully on board that crazy train now too. It was my personal experience that my LDS friends and family were adamantly pro-life with NO exceptions. I’m fairly certain that if I tried to get my former friends to concede that there are times when abortion might be preferable or at least allowable I doubt they’d give that inch. But the official LDS position on abortion is that there ARE possibly exceptions that justify an abortion. It even leaves that open to personal adaptation after a lot of thought, prayer and counsel. And they are right! Abortion should not be something taken lightly and it should be a last resort, but my experience with so called pro-life members is that they wouldn’t even allow a second thought under any circumstances. I think the LDS church leaders encourage education, even for women, more than members think they do. This is an area where multiple voices carrying various messages cross paths and cause confusion. Perhaps because I’m a guy, I only heard the pro education message growing up so when my wife announced just months after our wedding that she didn’t want to complete her degree I was dumbfounded. We both relied on GA quotes and counsel to make our case. Her arguments focused on the baby-making expectation (even though we didn’t have any yet), mine focused on the “seek learning” scriptures and counsel. She won, but I still think she was wrong even within the context of the LDS faith and it became the first wedge in our marriage. I’ve heard General Conference talks and Know Your Religion presentations that didn’t actually use that word but taught the concept of grace quite beautifully. The truth is, however, that the “Be ye therefore perfect” message gets a lot more air time and the contradictions between the two expectations are rarely if ever addressed. Still, I think one can make a case for believing in the typical Protestant/Christian concept of grace and still cruise through most Mormon meetings. Most Mormons don’t take that path because it’s hard to understand or hear the whisperings of grace in the message when works and perfection are screaming so loudly. 1. The temporary Spirit Prison where non-Mormons and LDS slackers go to wait for their Mormon descendants to do their temple work and where they take the missionary lessons and become Mormon. The idea is that everyone eventually makes it out of here. 2. The permanent location of Satan and his followers. But it’s very hard to get here under Mormon doctrine. So, when I read a former member’s story about feeling like he’d go to hell for being disobedient or homosexual, I think he is exaggerating. There’s a difference between not making it to the highest level of the Celestial Kingdom and going to hell. Granted, the LDS concept of not making into the Celestial Kingdom is always presented as being hell-ish, but it’s really not. Actual LDS hell is a lot tougher to get into than most Mormons and most of us former Mormons admit. As I understand it, everyone has the light of Christ in them thus giving them a conscience. I never really understood the added benefit of members having the Holy Ghost then, but I guess doubling up can never hurt. In truth I think if you focus on the light of Christ teachings it eliminates the need for the Gift of the Holy Ghost. From what I can tell the light of Christ does all the same stuff and is even present with non-Mormon people all the time helping them choose wisely and do good. That’s a good acknowledgment that gets very little attention in the Mormon world. I think it’s because the accepted idea is that the Holy Ghost stays with baptized members all the time and the light of Christ will come and go…but the Gift of the Holy Ghost still comes with the caveat “as long as you are worthy” and so it sounds an awful lot like the light of Christ to me. It comes and goes as righteousness ebbs and flows. The official LDS position of suicide is that a person who does it may not be morally responsible for his or her own act. That didn’t seem to help my BYU roommate whose father killed himself because the general impression is that it’s a grave sin. It was such a shaming experience that my friend wouldn’t even tell me. His girlfriend told me. I certainly felt no condemnation or fear for his family’s eternal welfare. I think the family felt it strongly in their small town Mormon culture though. Why not instead default to the more compassionate side of the question as a general rule? I don’t think that members do that, even though I think the church does in an official sense. I don’t think the LDS church has officially stated which line item on your pay stub is used to determine your 10%. I think the general consensus is that you pay 10% of your gross, but it doesn’t say that anywhere and I believe you can make a very strong case for official tithing being much much less than that. This is one area where it seems a bit smarmy for the church to not be clearer on its expectations of members. I’m sure the obscurity benefits them financially more than a clear statement would, but to their defense I don’t think they’ve ever declared it to be 10% of gross. If you judged by the members I know, you’d think the LDS church was in favor of ANY American war effort. In truth I believe LDS doctrine passively accepts that wars happen and yet hopes for peace. I don’t see how you can read the Book of Mormon and not come away with the sense that only a defensive war is justified and that war in general is horrible, ungodly and should stopped at the first opportunity regardless of your political leanings. Is it just me or is Zion the elephant in the room that nobody wants to talk about anymore? As an LDS concept, it refers to everyone getting along, sharing mutual respect and kindness, being of “one heart.” In a very real sense it also refers to sharing actual physical wealth, or “spreading the love” as you might say, or doing what every member commits to do in their baptismal covenants. The LDS church’s past unsuccessful efforts at creating Zion in specific communities were a manifestation of the idea as written in the Doctrine and Covenants. And it’s still there. But if you even hint to a Mormon today at a communal sharing of even basic needs and services, then you get called a Socialist or a Communist. I really can’t see the difference between Socialism and the LDS original version of Zion. I get that Zion requires a very selfless frame of mind, and I get that it shouldn’t be forced upon people(even though it was in the early church) but I don’t get how it’s a bad thing to choose to move in the direction of giving a brother a leg up in the community as a whole. It’s actually part of LDS doctrine as I understand it, just not part of its practice. I’m sure there are other concepts that the church does better on than its members, but these are the ones that touch me and now let it be said that Dad agrees with the church more than its membership on a few things. 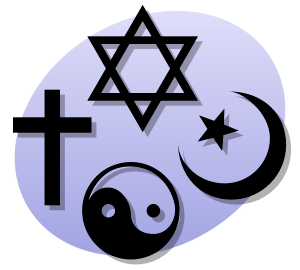 A new study finds Atheists, Jews and Mormons to be more knowledgeable about world religions than those in other religious groups. I probably qualify to some extent as 2 out of the 3 so I must be a genius! All kidding aside, I took a portion of the test that they put online and I got 100% (10/10). All three groups are considered as outside the mainstream and are mistrusted by the mainstream. Members of all three groups tend to have a high degree of educational attainment. Slice the study a different way, education was indeed the greatest determiner of scoring high on the test. Educated people know quite a bit more about religion whether they believe it or not. So, my plan is to educate my kids about any and all religions. I’m speculating here but I don’t think Mormons would score so well if the test were esoteric facts about their own religion. They are probably more like the lessor scoring Catholics in that arena. For me, the greatest weapon against my religion was the more I learned about it. I read the Bible, the Book of Mormon, devoured books by my religious leaders. I didn’t read things against it. I studied it from the inside out…and that led me out.